He who fights with monsters should look to it that he himself does not become a monster. And when you gaze long into an abyss the abyss also gazes into you. Friedrich Nietzsche, Beyond Good and Evil. "We are the keepers of mysteries and secrets that other Tribes, even other Changing Breeds would not be able to handle. This is our task and this is our desire. We must do our duty and guard, lest we lose another Brother. Lest all that which happened when the Wyrmbringers came come about again. What must be done will be done." - Eagle-Eye. The Uktena are the Older Brother Tribe of the Pure Lands. 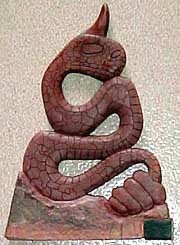 They follow a totem considered dark by many; the river-serpent Uktena, the watcher who sees in hidden places. Like their totem they prize knowledge, prize learning and are fascinated by magic. Many of the Gifts of the Uktena have an element of the mystical in them above and beyond the standard for Tribes, and they have a deep connection to some parts of their nature. Some whisper that their desires are fueled by the Wyrm, who waits until the right moment to exploit their curiosity and whisper the secrets of the Spiral in their ear. Micawi Two Snakes Mercy, Cliath Theurge.